One notable trail that winds itself through the Lebanon Valley is the Lebanon Valley Rail Trail. This mixed-use greenway offers users of all ages and abilities the opportunity to explore the social and industrial history of our area. Discover Mt. Gretna and it’s surrounding areas along the route, or start your trek from Downtown Lebanon and step into our rolling countryside. The Ice Cream Spur trail between milepost 6 and 7 connects the main Lebanon Valley Rail Trail to the quaint community of Mt. Gretna. A short walk through the former grounds of the Mt. Gretna Amusement Park provides access to all the attractions in Mt. Gretna including the Jigger Shop. 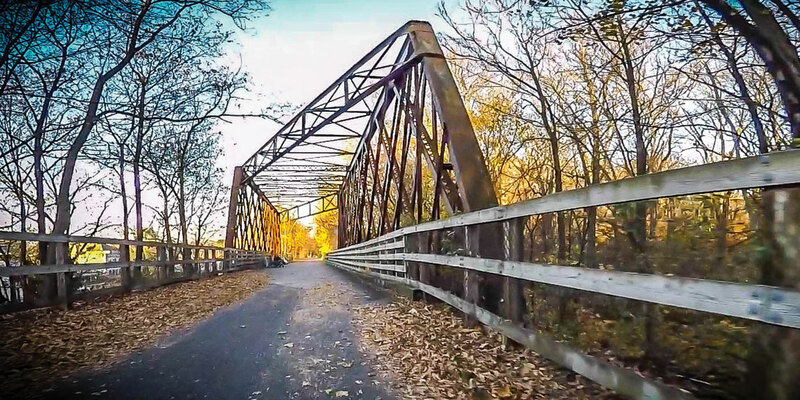 Created from the former Cornwall-Lebanon Railroad built by Robert H. Coleman in the 1880’s, the Lebanon Valley Rail Trail follows a route rich with social and economic history. In the old days, special passenger trains carried visitors to the popular summer resort community of Mt. Gretna. During the 1800’s and early 1900’s, the railroad also provided transport to the Pennsylvania National Guard training encampment near Mt. Gretna. Eventually passenger service ceased, and the Pennsylvania Railroad acquired the line. Freight service to the main line in Lancaster County continued until Hurricane Agnes washed out sections of the track in 1972. In 1999 Lebanon Valley Rails-to-Trails acquired the corridor to develop a multi-use trail. A 14 mile corridor extending the end of the existing Conewago Trail at the Lancaster County line northeast into Lebanon. The trail passes through communities of Lawn, Colebrook, Mt. Gretna, Cornwall, South Lebanon and the City of Lebanon. The trail is a great resource for recreational activities like walking, running, bicycling, cross country skiing, horseback riding and nature studies.